Hi, my name is Mandy Thompson and I'm living in Indianapolis. I started playing Telecasters when I was thirteen as a rhythm guitar player in my dad's band and I haven't turned back since! You can check me out on MySpace here and here. Click here to hear Mandy Thompson demonstrate her '51 Nocaster with Barden pickups!!! The main modifications I like to make to my Tele's are pickup swaps - I'm a big fan of Joe Barden pickups and currently only own one Telecaster without them. I'm also crazy about Vintique hardware, specifically his volume and tone knobs as well as his neck kits. Here's Mandy featured on two cuts from the GretschPages CD Compilation II...have a listen! 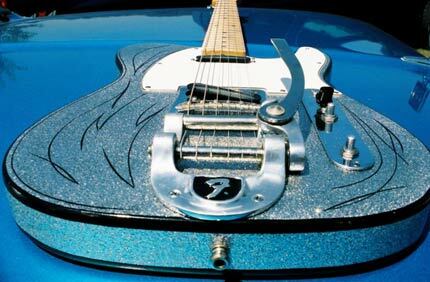 Yep, it's a Tele! 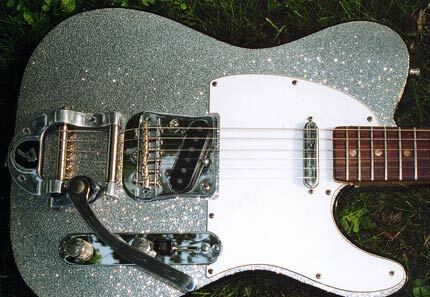 This is a 1968 Tele that I had refinished in a chunky silver sparkle with taped off black binding. I added the Bigsby and since the photo was taken I've added Joe Barden pickups to it. I just purchased a vintage V-profile maple neck that I'll be swapping the rosewood neck for soon. The blonde is a 1972 that I added compensated brass saddles to as well as some water transfer decals. 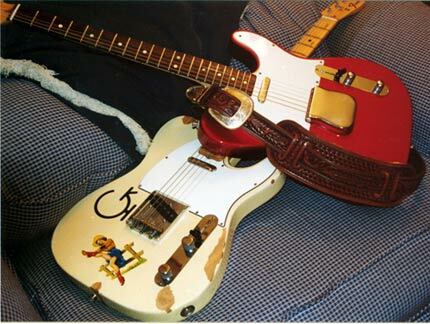 The red one is a 1976 that I kept stock except for compensated brass saddles and a Joe Barden bridge p/u. Lordy, Lordy, that thing is gawdy! 1968 refinished in a chunky silver sparkle - Joe Barden pickups, 1MEG pots, and just added 'striping. It's pretty simple (just what I wanted) and copies a bit off Gatton's pinstripes. It was my friend Diane's first real attempt at pinstriping and I think she did a fantastic job!